Dennis O’Connor is the Chief of the United States Mint Police. He is responsible for all protection programs and law enforcement functions for the Mint facilities in Washington, DC; Philadelphia, PA; West Point, NY; Denver, CO; San Francisco, CA; and the U.S. Bullion Depository at Fort Knox, KY.
Dennis joined the Mint in August 2007, from the Directorate of Homeland Security (DHS), Immigration and Customs Enforcement (ICE), Office of the Federal Protective Service (FPS). While with FPS, he held several HQ positions that include Chief of Staff, Director of Special Operations, and Director of Security and Technology. 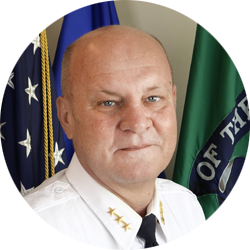 His last assignment with FPS was as the Regional Director for the National Capital Region, where he provided security and law enforcement services for 750 federal facilities housing more than 300,000 federal employees, and managing a budget in excess of $100 million in direct funding, in addition to indirect funding for contract services. As the Regional Director, he led a force of 200 police officers, criminal investigators, inspectors, physical security specialists, training personnel, and support staff. He also provided oversight and training to 5,700 contract guards. Prior to joining FPS, Dennis had a 21-year career as a U.S. Air Force Security Forces member. He has extensive experience with physical security, managing a variety of security functions, including overseas operations, law enforcement operations, continuity of operations planning, occupant emergency planning, explosives detection, hazardous materials protocols, training, and public affairs. He earned a Master’s degree in International Relations from Troy State University, a Bachelor’s degree in Public Administration from Roger Williams University, and an Associate’s Degree in Criminal Justice from the Community College of the Air Force.